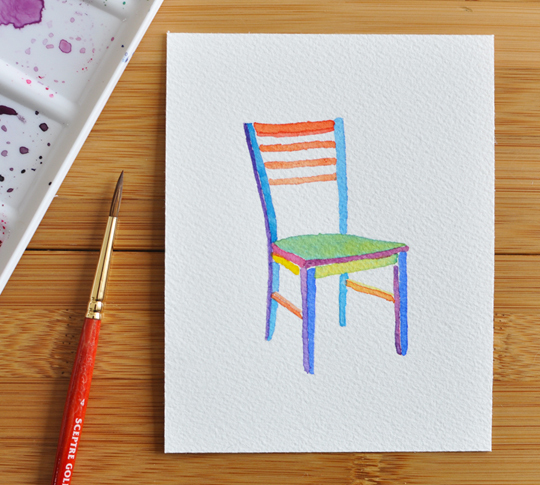 Today's creative thing: a colourful chair. And a new journal idea, surprisingly. I'll have to do a little research, but I can't wait to give it a try. You are an amazing artist. I love what color does to a fairly boring object -- and you are so good at picking just the perfect ones. Your creative thing a day is inspiring. I'm enjoying this series inspiring too! Thanks so much, Everyday Things! Just a note to say how much I am enjoying this series - it's intriguing to see each post and what you've picked for the day. You're going great! Very much behind the 8-ball on this, but catching up now. I love your use of color! I love this! Simple and beautiful watercolor! !